If you’re looking for something special and unique, we can make it. Create one of a kind custom jewelry. We can create your design from a photo, drawing or your imagination using our 3D CAD jewelry computer program. During the process Heather will email you 3D photo’s of the design for your approval, once you have approved the design, it will be grown into a wax model that we will cast into either, gold, platinum or silver to complete your design. After casting, William will complete your design. Custom design gives you the pleasure of creating and owning a singular piece of jewelry that will become a part of you and your family. 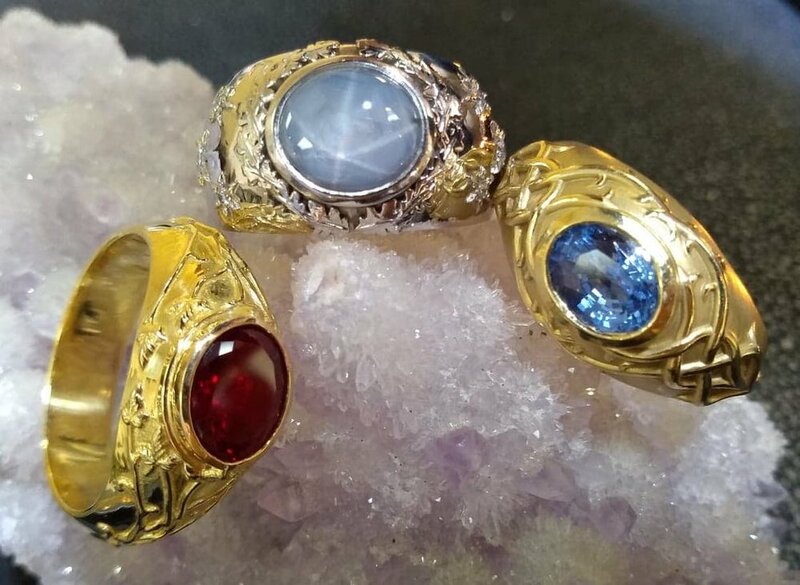 We can create a new design using your family heirloom gemstones or we can find just the right stone for you. This tanzanite ring is a custom design ordered by a customer. We located the perfect tanzanite for our customer, had it cut by a local, award winning gem cutter and then created the platinum and diamond ring mounting. This is an example of only one of hundreds of rings we have created and made here at Villa Jewelers. Photos on this page are examples of custom designs made here at Villa Jewelers.